Lots of musicians have kids. All the famous old guys have kids: John Lennon, Bob Dylan, Elvis. But for a male musician it’s much easier – their female partner can hold/feed and soothe the baby during gigs. Or stay home with the baby. For a woman with a baby, you can’t just leave the baby at home and hit the road. Breastfeeding means you pretty much have to be with the baby 24 hours a day. This means bringing your baby to gigs and having a pair of loving and trusted arms to hold the baby while you play (and if the father of the baby is in the band, it can’t be him!). It means breastfeeding just before you go on stage – and getting bandmates to set up the stage and maybe even soundcheck for you. Otherwise you might end up with the trauma of a hungry, crying baby up the back of the room mid set. It often means taking the baby outside while the music is playing if the levels are too loud for little ears. It means not having a drink with everyone after the show – and still being the most sleep deprived the next day. Being pregnant on the road was a breeze compared with having an 8 week old with us! People find the sight of a new mother on stage a bit confronting – breastfeeding mothers are a strangely uncommon sight for many people. 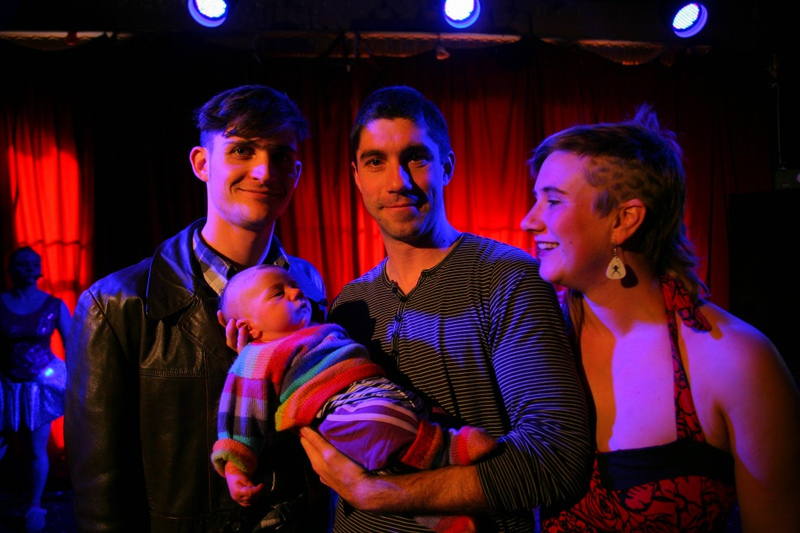 I was almost turned away by security at one gig, because they had never seen a baby at a venue before. Even shop assistants say things like “Wow! You’re brave leaving the house with such a tiny baby!”. I don’t bother telling them I’m on tour with a band and have a show that night. But it’s also totally doable, and lots of other amazing women have done it. Ani DiFranco, Sarah Humphreys, Clare Bowditch, and the pioneer Maybelle Carter have all managed it. Taasha from The Audreys has just announced the birth of her baby boy – and a raft of gigs in a few months time. We just survived our first mini tour with a baby. Late nights, 1200km, 5 gigs in 5 days combined with sub-zero temperatures made for some challenging moments. But the shows were good, baby Griffin was content and happy and our baby holders were amazing! Much respect to all the other breastfeeding performers out there. 2 – coping with other people’s judgmental comments. One of the first things someone said to me when they found out I was pregnant was ‘oh you’ll have to stop doing gigs then’. This was astounding news to me. All I could say was ‘um, I disagree’. (This comes along with a litany of other unhelpful advice along the lines of: you’ll have to get a bigger house, sensible car and buy heaps of plastic crap). Why is it that when you announce you’re pregnant, people assume that you have to get a lobotomy and start living a suburban nightmare? I had no idea I could feel so utterly utterly buggered. For the first couple of months, I would come home from work, sleep for a few hours, eat some tea then sleep for another ten hours. It felt like being on some kind of sedative 24/7. Feeling tired and crap for the first couple of month made rehearsals a bit unproductive. Also, Pretty Boy Floyd and the Weary Hobo have been doing most of the driving when I’ve been feeling so sleepy I could fall asleep any time, anywhere. I feel very lucky that there’s a lot of love and trust in The Lurkers and the Weary Hobo and Pretty Boy Floyd are extremely accommodating with my mood swings and unexplained tears. Playing music makes me feel so much better and usually the tears dry up after a song or two. A cuddle, some singing and not being treated like a freak are a pretty good cure for pregnancy mood swings. Actually travelling so far has been great. 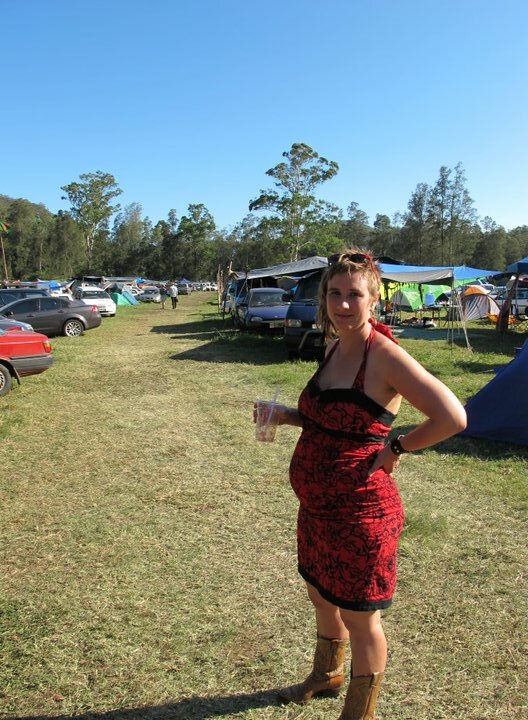 We toured to Melbourne and Adelaide when I was 11-13 weeks pregnant. I was feeling tired and sick for the first bit, but turned a corner about a week in. Being on the road was really great at that time – playing music and travelling with The Lurkers makes me feel good despite the weird hormones pumping through my body. Despite the travelling, it was much easier than being at work, where it’s not really appropriate to cry during meetings. We’re planning to go back to Melbourne and also do another stint in the rehearsal studio in March, at which point I’ll be 7 months pregnant. We might need to take the driving slowly and plan in a few extra rest breaks than usual. In our last recording session, the baby actually started kicking in time after listening to “I’m in love with a skinny man” for 90 minutes. I’m hoping that means it’s starting to recognise the music and will therefore feel safe and happy at gigs. Playing at Peats Ridge Festival was awesome, though the heat was full on. Your body is already hotter when you’re pregnant, and it definitely makes the heat harder to cope with. So the chai tent at 40 degrees on a summers afternoon did take it out of me. You can see in this video my hair is drenched cause I had to duck backstage and douse myself in a bottle of cold water halfway through the set. This logistical challenge is still to come! My tummy is sticking out a bit, but I can still hold the banjo with no dramas, and I haven’t had any breathing troubles yet. 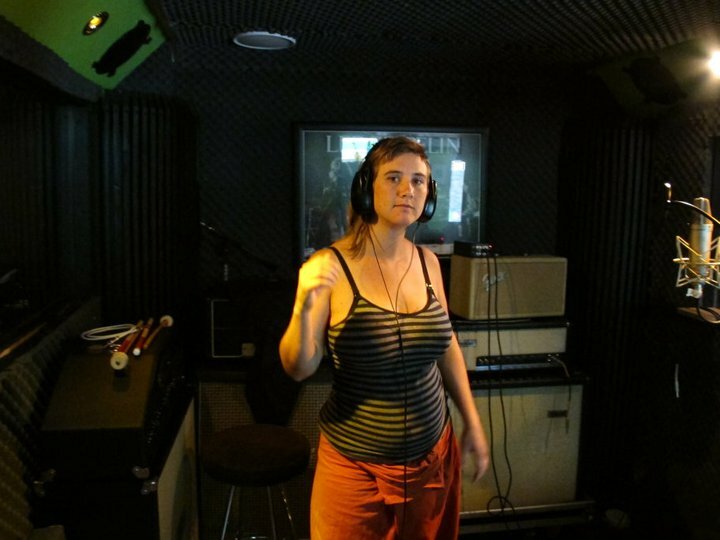 We’ve got a song on an upcoming compilation of Eric Bogle songs, which is being launched at The National Folk Festival at easter – by when I’ll be eight and a half months pregnant. I’m hoping we’ll be there to perform at the launch, but we might just need to see how we’re faring then. There are so many changes in such a short time it’s really hard to know what it will be like. After the baby is born (due 8th May), we’ve put a line through all of May – no gigs and no pressure as we spend some time hibernating and showing a new little person around this amazing word of ours. 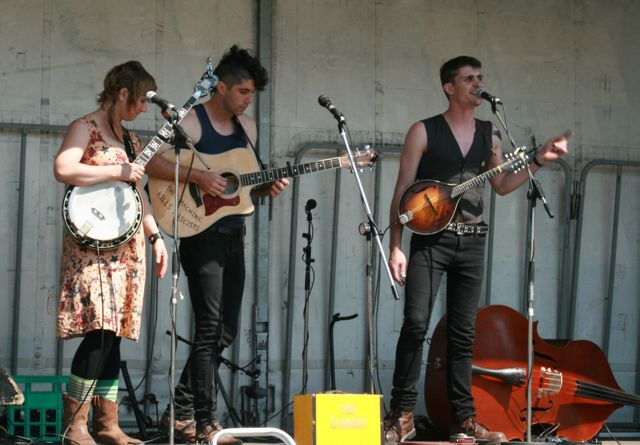 But we’ll ease our way back in gently, with a show at Hornsby Folk Club in June, and then our album launch in August. We’re also contemplating a trip up the NSW north coast in October. We’ve put a window in the back seat of the Lurker van so we can bring this new little character on the road. Also, before you ask, no – The Lurkers are not planning to become a kids band. All offers of baby holding during gigs will be taken seriously and are very much appreciated. This is controversial: I know lots of feminists who either have a cleaner, or who want to justify why it’s ok. I disagree. I don’t think it’s ok.
Feminists have long been fighting for gender equality (obviously!) and a big part of that battle is liberation from the drudgery of domestic chores. In a world of gender equality, men need to pick up their end of the bargain and contribute equally to washing their own undies and mopping the floor. All pretty obvious. I believe we are fighting not for total liberation from domestic chores, but for the load to be shared equitably. If you get a cleaner to do it for you, you have solved the problem of gender equality in that domestic arrangement – noone has to do the housework and everyone is happy. But by employing a cleaner, you haven’t solved the inequality – you’ve just transformed it to an inequality of class. Surely as feminists the whole point is to deconstruct and redistribute who holds power and privilege in society – not just to reshuffle it so we find ourselves in the coveted position of privilege and power. To solve gender in equality by introducing a new inequality of class defeats the whole purpose. PS Tell me if you disagree! Let’s have it out.